The weather may have been gloomy, but we had a booming turnout at the 5th Annual Client Appreciation Crab Feast. Approximately 160 guests ate their hearts desire of Maryland blue crabs, Chesapeake Bay crab soup, burgers, hot dogs, watermelon, assorted pies, brownies, and free-flowing beer. Once everyone had their fill, there was still plenty of goodies to take home. A nice wine basket, Carvel crab knives, and Mason’s gift certificate were given away and everyone seemed to enjoy the company around them despite the rain that was pouring down. Scott’s newest grandson, Corbin, 2 months, attended his first crab feast, dressed appropriately in a crab themed onesie and hat. Also in attendance were Scott’s grandkids Lily and Jackson, who seemed to have lots of fun in the accumulating puddles. They got soaked to the bone but luckily had some dry clothes to change into. A big thank you goes to Eglseder Wealth’s newest team member, Jennifer Taylor, and her sons Gunner and Carter, who helped to diligently bus tables as the picked crabs piled up. We hope that everyone who attended enjoyed themselves as much as we did. It is always a pleasure to come together in appreciation of the trust and confidence our clients continually place in us. 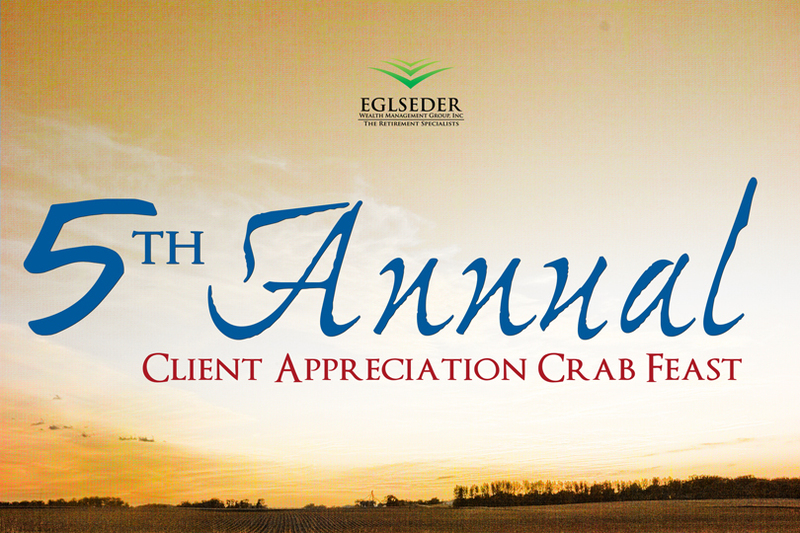 Thank you so much for being a part of the Eglseder Wealth group!